The Brita On Tap water filtration system is an economical way to enjoy the great taste and healthy benefits of filtered drinking water without having to rely on water bottles or water filter pitchers. 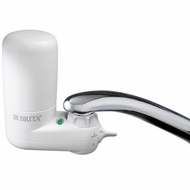 The Brita 35214 faucet filtration system fits all standard faucets, and you won’t have to use tools to attach it. Our everyday sale prices at Today’s Concept make healthy living a bargain. Use our shipping calculator to view your fast-delivery options before checkout.